Eleni Papanou wrote her first poem when she was an outcast at school. Honored with the name, “Greek Freak.” She started to feel like one and believed life was plagued with torment and endless suffering. A spontaneous kundalini awakening thrust Eleni on a spiritual path and constantly tested her to the breaking point by challenging her world-view and everything else she held sacred. Through visions and personal insights, Eleni eventually discovered the Universe has a sense of humor. She started laughing more—mostly at herself—whenever she caught herself taking things too seriously. After many years on the path of self-rediscovery, along with a bout with cancer and caring for her two daughters, Eleni had a lot to say. Having already written several screenplays, she started writing novels where she could freely express her spirituality. Unison by Eleni Papanou is a well-written science fiction book. It is told by Damon, the leading character of the story, in great detail. The time is after the Great Cataclysm and the city is Unity. Home is a very large dome offering protection from the contamination of the Outsiders and their world. Damon advances to a high level in Unity and is responsible for creating the technology that is wrongly used on the people. Damon believes the time is right and that it has become necessary to escape and explore the real world. We travel with Damon as he is reincarnated over and over and re-lives his life remembering the errors of his ways and always trying to make the changes that would correct his mistakes. With each reincarnation Damon finds himself outside of Unity, in the same cabin, being faced with the same horrors, trying to go back and fix the wrongs. As he awakens from each reincarnation he is faced with the same doubts: Flora the woman he loves trying to bring him back to Unity, leaders chasing him and meeting the same people again and again. Each reincarnation brings him closer to the truth and he is able to handle the situations differently. Upon his final awakening, Damon and we learn the truth of his journey. Unison is written for the science fiction reader. Eleni Papanou presents the story in a believable way with characters that are strong and well defined. The last chapter of the book does a great job of answering all of the readers’ questions and it also includes a great ending that I didn't see coming. 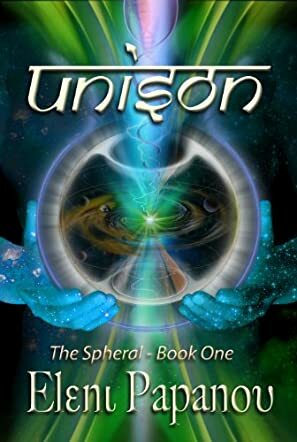 If you are a science fiction fan then I recommend you pick up a copy of "Unison".